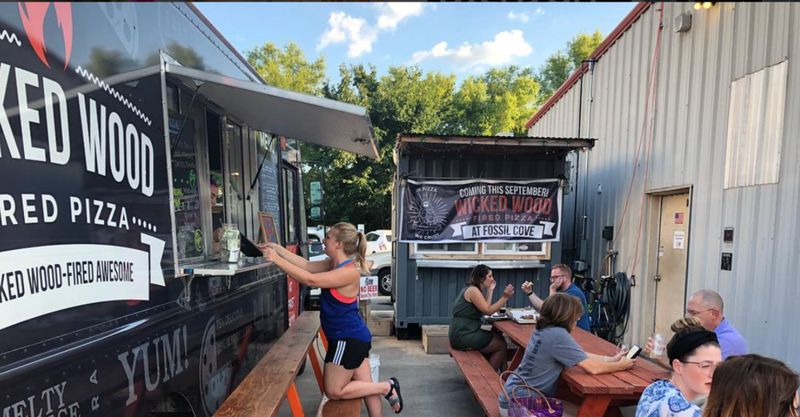 what do A trailer, truck, and container kitchen have in common? They all serve Wicked Wood Fired Pizza! Serving late night in Downtown, Wicked Wood Fired Pizza - OG is centrally located in downtown Fayetteville, AR. to provide delectable and delicious late-night salvation from any and all Dickson Street shenanigans. All people should have access to crispy, crunchy, cheesy pizza, so we say "Bring the pizza to the people!" W.W.F.P. Mobile travels to breweries, festivals, community events, office parks and provides wedding catering services to Northwest Arkansas. Wicked Wood Fired Pizza's newest location is slated to open this September. Partnering with Fossil Cove to provide beer-inspired menu items, Wicked Wood Fired Pizza at Fossil Cove will have the most wicked eats yet!